It is the 1800s during Queen Victoria's time and a substance is found called anti-ice, which expels a huge amount of energy when heated akin to a nuclear bomb. This substance changes the world and ushers in a new age of wonders. Britain is still the world dominating power, but more so since the discovery of anti-ice. France and Prussia are still Britain's rivals and the Earth has two moons. Anti-Ice adheres to the name Steampunk in the strictest sense possible. This is a Victorian affair with all the comedy of manners that goes along with it and the cast is right out of Verne and Dickens. The story begins in the past with a letter describing just what a terrible force anti-ice can be and than moves on to triumphs humanity can achieve with the substance. From there we follow the adventures of Ned Vicars, mild mannered junior diplomat who gets flung right into the middle of everything including an anarchist plot. The man responsible for many of the wonders of anti-ice is the stovepipe hat wearing Josiah Traveller aka the Mad Scientist who eventually comes to center stage in his own detached and incredulous way. Anti-Ice is very much an adventure tale crossing Europe and far beyond. One thing I said to myself not long ago was that I hadn't seen a modern Steampunk book go to space. I have read one short story though, but a novel length work was in order. I don't know how I missed Anti-Ice for so many years as it does that very thing and it does it with style and a sense of wonder. Anti-Ice is Baxter light for those who find some of his newer work overwrought as much British humor is strewn throughout, which was surprising coming from Baxter given his more recent work. At no point does it feel heavy or drag. Much of the ending was predictable, but seeing it all happen was no less enjoyable. 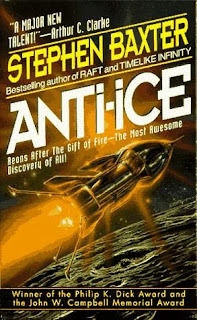 In many ways Anti-Ice is Baxter's homage to Verne and Wells evoking the same kind of sense of wonder that they pioneered, especially with regard to Wells' The First Men on the Moon. Anti-Ice twists history in interesting ways to give us an alternative past that is well worth exploring. I give Anti-Ice 8 out of 10 hats. Baxter just may have won me back to his side after finding some of his newer period books less than astounding. Anti-Ice is currently out of print, but well worth tracking down as it zips by before you know it. Sounds to be a very promising read. Unfortunately it seems a bit difficult to get a copy of Anti-Ace because it is out of print. Baxter also has a short story set against a very similar background as Anti-Ice, called "A Journey to the King Planet".